One of the great joys of Judaism, embedded in its longevity and ability to change and adapt to circumstances and geography, is the multiple layers of meaning that are attached to anything of moment. An egg is never just an egg. Bread is never just bread. And a circle is never just 360 degrees of perfect shape. We can look at the Passover story as a great tale of escape from slavery, with ten plagues, and a sea parting. Or we can look at the story as the struggle between a vulnerable minority against its mighty ruler, a class struggle, the universal story for freedom for all. Or we can look at it as the redemption from our inner struggles with self-slavery—to addictions or technology or food or overwork or inertia. Or we ce can—must, I think—relate it to our current realities. Or we can do all of these and more. After all, the seder—the ritual itself, which means order (out of chaos and the prescription for the ceremony both (again))—is already a dual meal—we wash our hands twice in part because we are sharing a spiritual meal and physical one. We taste the maror (bitter herb), and we think of the bitterness of slavery and we taste the actual bitterness of the root. We see the matzah as the bread of poverty, the bread of affliction and the bread that was all we could take with us in a hurry. It stands for humility, none of that fluffy, yeasty stuff for us, because we have work to do now—on ourselves and on our world. 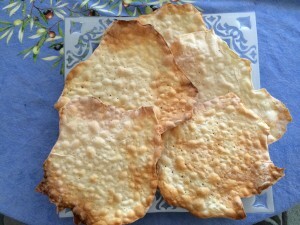 I also love the food…I save most of it for these eight days, so that I can really look forward to and savor it…Even matzah during the eight days tastes good (okay, egg matzah tastes good), but its meaning far outweighs the taste. I love our charoset. I love making horseradish. I love our matzah balls (thanks to Ron Duben). I love macaroons and flourless cakes. I even really enjoy our salmon gefilte fish. I especially love cooking with my family for this night. I love the gathering of folks together to share the story and its multiple layers. Family and friends together. And I miss the people who can no longer be with us, because of distance—both physical and relational. But mostly, I love—love—that this is our foundational story and that we are commanded to make a big deal out of it. We were slaves, we were strangers, we had to take those final steps to identify ourselves as Jews and then step into that sea, together. Our freedom was not just freedom from slavery, but freedom to live a life dedicated to the values of caring for each other, being responsible to each other, practicing kindness and generosity and courage and, yes, humility. May this be a sweet Pesach for you and yours. Know that you are in our hearts as we finish cooking and cleaning.